Home / Meet our FREE Chrome Extension! You can’t always call up Best Google SEO Helper to do a massive page audit. That’s because you are busy, and so are we: we cannot apply pleasurable service to the tens of thousands of customers in the world. So we created this tiny chunk of software to apply our wisdom to your website for us. It’s time for you to acquire/grab the Best Google SEO Helper Chrome Extension. Then the magic happens. 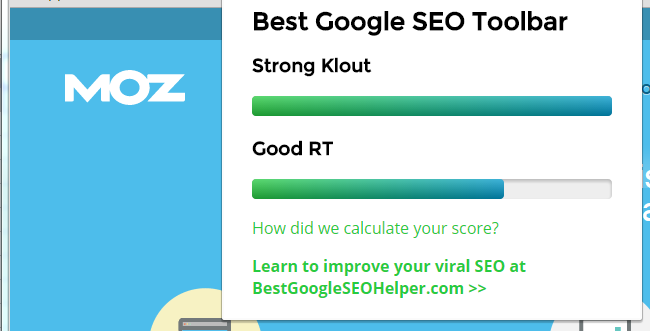 Any time you are on a web site, Best Google SEO Helper Chrome Extension monitors the page for two basic crucial metrics: Strong Klout and good RT. You will never find another Chrome extension that does this according to our secret algorithm. Klout is an online influence measuring tool for individuals. But did you ever stop to consider what the world would be like if Web pages and properties possessed strong Klout too? We sure did. Just ask Harold G. Harold was satisfied with a meager Klout score of 47, but when he realized that pages might need Strong Klout, his Web game increased tenfold! RT is the juicy center of social internet, and it can be either good (tasty, divine, pleasing) or bad (unsavory, gross, diminuitive). Just ask Karen W. Karen kept tweeting photos of mundane frog skins from around the world. Her social RT was considered scrawny and unemployed. When she started receiving and investing in good RT her perks skyrocketed away! The formula works. It just works. And fortunately for you it is free. We share our Chrome extension with you because remember: we are the BEST Google SEO HELPER. It’s not enough to be a helper. You need help, granted. But you also need the best! This is why we call ourselves the Best Google SEO Helper: so you know and believe that we are the best at helping you with Google SEO to achieve Strong Klout and good RT. Then you must navigate to a Web page. We recommend that you navigate to your own special website. Now click on the Best Google SEO Helper extension button. WOW! Look at what you have uncovered! You are now aware of whether or not you have strong Klout and good RT. And it doesn’t stop here. You can also use this on your competitors. We did this for our self-styled rival seoMoz (now Moz) and look at this! Better get our Chrome extension, Moz, because your RT is not good.